Folks were encouraged to bring in slips of paper with their “bad memories” from 2008 written on them. They would then take turns running them through a giant, industrial shredder, eating up those bad memories. 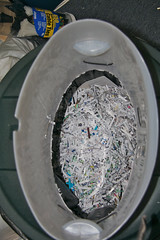 It seems like bank and retirement statements were some of the top items to be “fed to shred”. But I also recall things like “cancer” and other diseases being included, as well as a few relationship items. I suppose it is true that we all long to rid ourselves of these “bad memories” and painful events in our lives. And to a degree I don’t think it is bad to want that or even if we can, when possible, do so. But maybe there are also some good things to come from these sorts of things from time to time? Paul had something he wished to “shred”; God to him that His grace was sufficient and in Paul’s weakness God’s greatness was manifested (2 Cor. 12:7-10). He didn’t remove Paul’s thorn but gave him the grace to live with it. Our own problems effect us more and more as we continue to dwell upon them. They can cause difficulties in our lives in a multitude of ways: with our families, our friends, at work, at social events. But worse of all, if we continue to dwell on them they will inevitably cause problems in our most important relationship: the one with our Lord and Savior. How thankful we ought to be that we have a way to “shred” these things: by casting them upon Jesus and trusting in His provision and grace.